Quotes But you must remember, Mowgli, "Greater love hath no one than he who lays down his life for his friend." When great deeds are remembered in this jungle, one name will stand above all others: Our friend, Baloo the bear. Baloo: He's crackin' me up. Bagheera: The memory of Baloo's sacrifice and bravery will forever be engraved on our saddened hearts. Baloo: Beautiful. Bagheera: This spot where Baloo fell will always be a hallowed place in the jungle, for there lies one of nature's noblest creatures. Baloo: I wish my mother could have heard this. Bagheera: It's best we leave now. Come along, Man Cub. Baloo: Hey, don't stop now, Baggy. You're doin' great! There's more. Lots more! 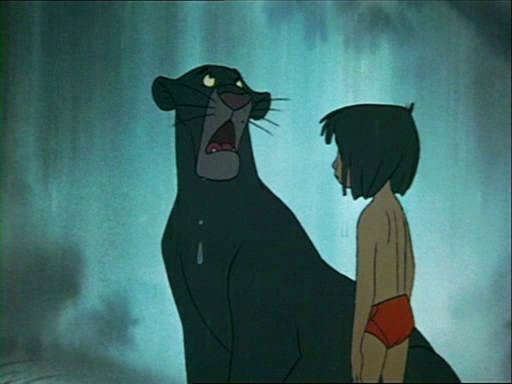 Bagheera: Why, you big fraud! You four-flusher! I'm fed up! Mowgli: Baloo, you're all right! Baloo: Who, me? Sure I am. Never felt better. Mowgli: You sure had us worried. Baloo: I was just takin' five. You know, playin' it cool. But he was too easy. Mowgli: Good old Papa Bear. Dizzie: It's going to be a bit dull without the little bloke, isn't it? Buzzie: Yeah, so what we gonna do? Flaps: I don't know. Now, don't start that again! Baloo: Hey, Baggy. Too bad you missed the action. You should have seen how I made a sucker out of Old Stripes with that left up in his face. "Boom, boom," I was givin' him. Wanna know somethin'? We're good sparring partners. Mowgli: You'd better believe it. Baloo: Yes, sir. Nothing or nobody is ever gonna come between us again. Girl: My own home. Mowgli: Look! What's that? Baloo: Oh, it's the man-village. Mowgli: No. I mean that. Baloo: Forget about those. They ain't nothing but trouble. Just a minute. 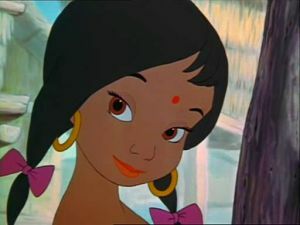 Mowgli: I've never seen one before. Baloo: So you've seen one. So let's go. Mowgli: I'll be right back. I want a better look. Baloo: Mowgli, wait a minute! Bagheera: Oh, Baloo. Let him have a better look. Baloo: She did that on purpose! Bagheera: Obviously. Baloo: Mowgli, come back. Bagheera: Go on. Baloo: He's hooked. Bagheera: It was inevitable, Baloo. The boy couldn't help himself. It was bound to happen. Mowgli is where he belongs now. Baloo: Yeah. I guess you're right. But I still think he'd have made one swell bear. Well, come on, Baggy, buddy. Let's get back to where we belong. And get with the beat. 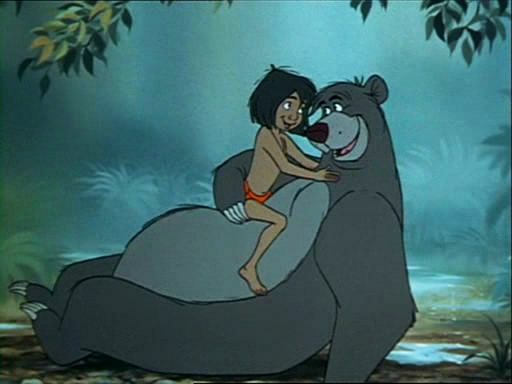 Look for the bare necessities, the simple bare necessities, Bagheera: ...forget about your worries and your strife, Baloo and Bagheera: I mean the bare necessities, are Mother Nature's recipes that bring the bare necessities of life.